Here in Torrington, we look forward to introducing our patients to DIAGNOdent, which is a state-of-the-art diagnostic tool that can pinpoint cavities anywhere in the mouth – even when they’re too small to be detected by the human eye. 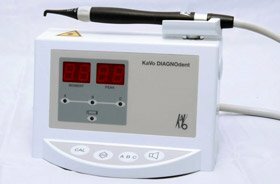 This tool consists of a small laser that uses wavelength technology to create a numerical readout that contains detailed information about a patient’s tooth enamel. After establishing a healthy baseline, the laser is simply passed over the tooth surfaces in order to compare their particular wavelength. As a result, our team can effectively find and treat cavities much more quickly, preserving tooth structure and maintaining a minimally invasive approach.